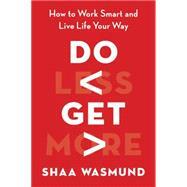 Our culture has made it a badge of honor to be stressed, frazzled, running on emptybut Wasmund is on a mission to change that. Her book is for everyone who runs from task to task, trying to be all things to all people, never feeling like they have the time or energy to give anything their full attention. She shows that when we embrace a less is more attitude, we can appreciate all the good things we already have and find the courage to prune the nonessentials. And then we can find the space in which to pursue exciting new opportunities. SHAA WASMUND is one of the UK’s most prominent female entrepreneurs and the author of Stop Talking, Start Doing. She is a prolific public speaker and champion of small businesses, and the driving force behind Smarta, the UK’s leading support platform for small business owners and entrepreneurs. She lives in London.